Maybe we’ll have tomatoes by Labor Day! B and I are still waiting for our 16 bales of hay to decline in temperature to about 80 degrees so we can plant our tomatoes, peppers, cucumbers, cantaloupe and squash. I was sure today was the day to plant. 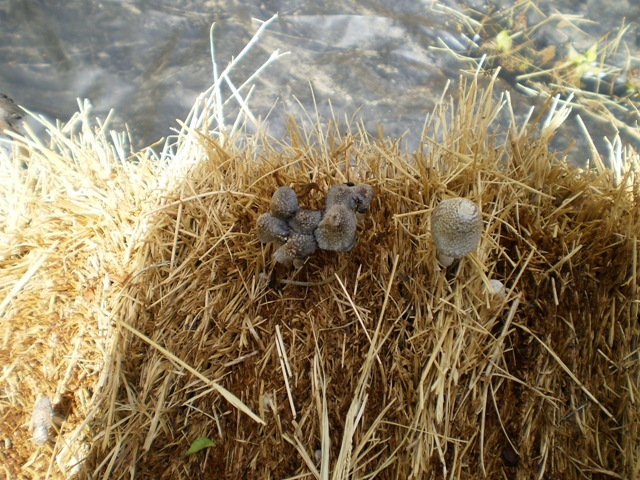 I rushed down this morning to take their temperature and low and behold, there were mushrooms popping up all over each bale. Ugly mushrooms. Toxic mushrooms. And the bales were still in the 100 degree range. I called B and asked him again why we were farming this way. He said not to worry, this is normal. The spores in the hay germinate and produce the most prolific crop of mushrooms you ever saw. I was thinking we could get arrested for growing hallucinogenic mushrooms. I considered taking a bite, but was afraid I would die right there on main street in my town. How embarrassing. But, will I live long enough to harvest the fruit of our labor? It’s looking kind of iffie. We’ve bought all kinds of heirloom tomatoes, exotic peppers and squash to feed the neighborhood. Now I’m just trying to keep them alive in those tiny little pots. Even more problematic: I’ m leaving Friday for the Nashville Half Marathon and B is going to the Double Decker Festival in Oxford. If it doesn’t rain, we’re in trouble. I figure we have about $250 invested in this venture including the hay bales, the plants, the additives to get the hay ready and the profuse water necessary to get things cooking. I hate to say this, but I’m thinking the Farmer’s Market might have been a better choice. But stay tuned. Let’s call this an experiment. Maybe we can get a grant from the Guvment. Who knows, we may produce a bumper crop and set up a little vegetable stand in downtown Starkville. This entry was posted in Gardening and tagged growing mushrooms, growing tomatoes in bales of hay, Homegrown tomatoes by Emily Jones. Bookmark the permalink.